Too often we hear extraordinary claims, rumours and misconceptions of what the supposed reality of Worcester City FC at Perdiswell would be. We also understand that not everyone is familiar with football and can only trust what they hear, which can be inaccurate. We have always tried to communicate as clearly as possible, so we have created this ‘myth debunking’ page to set right the wrongs you may have heard about Perdiswell. We want to reassure that our proposals will be of great benefit to the community. Every step of the journey has been made with the people of Worcester in mind. No, quite the opposite, the planned stadium at Perdiswell would be a modest non-league stadium. Non-league stadiums and Premier League stadiums are incomparable in relation to size. This is a misunderstanding with the term capacity, it will only have one 565 seat stand, but will be 4,400 capacity, meaning an absolute maximum space for 4,400 attendees consisting of seating and standing. 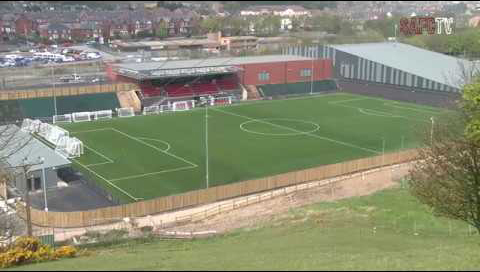 It would be a similar size to Scarborough Athletic’s stadium (below). Incorrect, the stadium is intended to be built on the unused section of land in between the existing pitches and the leisure centre. Furthermore, the proposed development includes new 3G pitches to replace the current pitches behind the leisure centre, so would in fact improve the facilities available. No, the Club and Trust have gone to extensive lengths to research achievable and sustainable funding structures and streams. We have been advised by leading industry experts from Supporters Direct and Sporting Assets to identify how the stadium would be funded. False, this has never been the case. In due course we will be seeking a Community Asset Transfer of the land. However, we remain open to other means of leasing the land, should the opportunity arise. This would generate additional income for the council and enable us to deliver facilities that would complement and enhance those already at Perdiswell to the benefit of the many, not just the few. On the contrary, the plans include an extra 82 car park spaces, so would improve the current facilitates. In addition, not all supporters travel by car, the site is within easy walking distance of large parts of the City and close to regular bus services and cycle routes. As the image shows, the main stand’s roof line will be considerably lower than that of the leisure centre with it only being a two-story building. Worcester City FC first team games will equate to approx 1.14% of yearly use. We currently have five community organisations who would like to use the facility benefiting people of all ages all year round. The Floodlights will not be used at all from the end of April through to August. They will never be on past 10pm and will only be turned on during a match. There are currently approximately 20 car park lights which are on all year round. Modern floodlights are concentrated on to the pitch so cause little over spill. Quite the opposite – house prices have increased since the plan was first publicised. With the increase in community facilities it will make the area more desirable. This too is not the case. The Community Sports Hub will in fact take up very little space. There will not be free and open access to the Football Ground, just as there isn’t into the Sports Centre, Swimming Pool and Golf Course. However there will be a lot more activities available for the community, most of which will be free. Unlikely, City’s average attendance whilst away from Worcester has been around the 500 mark, and although would be expected to increase playing in Worcester, if attendances at St. George’s Lane are anything to go by, there could be around 600 attendees. This is an outdated, inaccurate, generalised and quite frankly banal stereotype of football supporters. Our supporter base is compromised largely of families and older people. Here’s a video showing our supporters at a match in 2017. In addition, there were no issues involving litter at Kidderminster nor Bromsgrove. On the contrary, we have 500 members including many professionals with a broad range of skill sets and professions ranging from accountants to lawyers. On the elected Trust Board we have Managing Directors, Planning and Development experts and several business owners to name but a few. You can find out more about the Trust Board here. Our structure also means that we are openly democratic, so any member of the Trust can stand in the yearly elections to join the Trust Board.